The primary definition of a coast. The processes by which coasts are created. The systems that compose coasts. 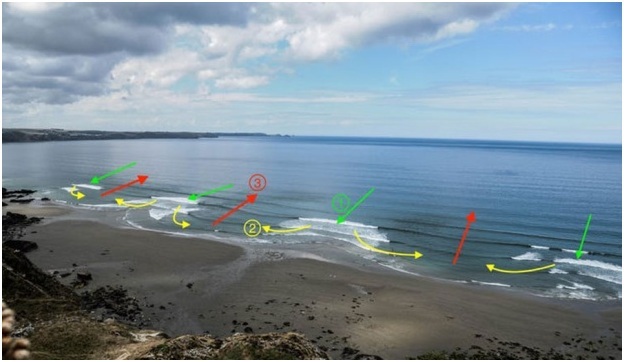 The different processes that occur at coasts. A coast is the part of land where the terrain meets a body of water, like the ocean. In this part of the land, many complex processes take place, but we will try our best to make it simple for everyone to understand. At a beach or on an island where there is a body of water, waves collide powerfully against the land or cliffs. 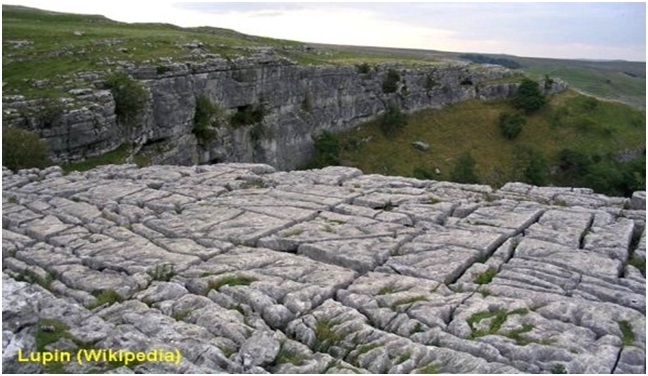 As a result, air and water are enclosed in the opening of the rocks which can lead to the development of cracks. 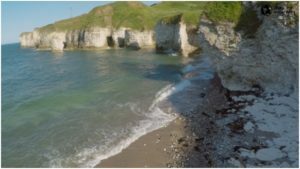 Sediment is produced by the waves crashing against the cliffs and wearing away the surface, which is then scattered along the coastline. Waves are an important factor in everything that occurs at the coasts. 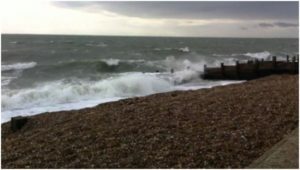 Waves are produced by wind gusts over the sea which make the water move in a particular direction. 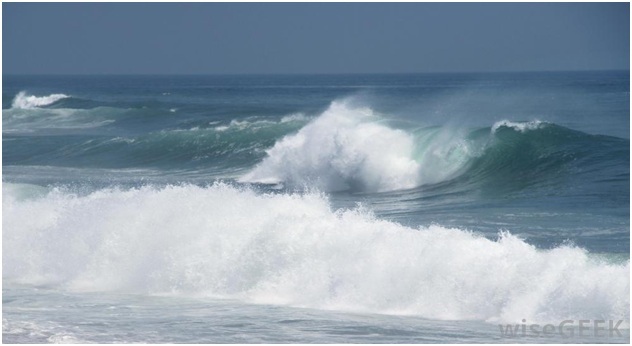 Wave breaks occur when waves are moving toward the shore and come up against the bed of the body of water. The base of the wave meets friction when it touches the land. When the waves approach the coast, the frictional force gets increasingly intense. While the crest (or top) of the wave continues moving very fast, the base of the wave slows. That leads to the uppermost portion of the wave curving and generating a wave breaker. 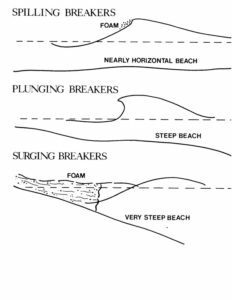 Spilling breakers – involves a slow peaking of the wave until the crest loses its stability which results in a moderate spilling ahead of the uppermost portion of the wave. 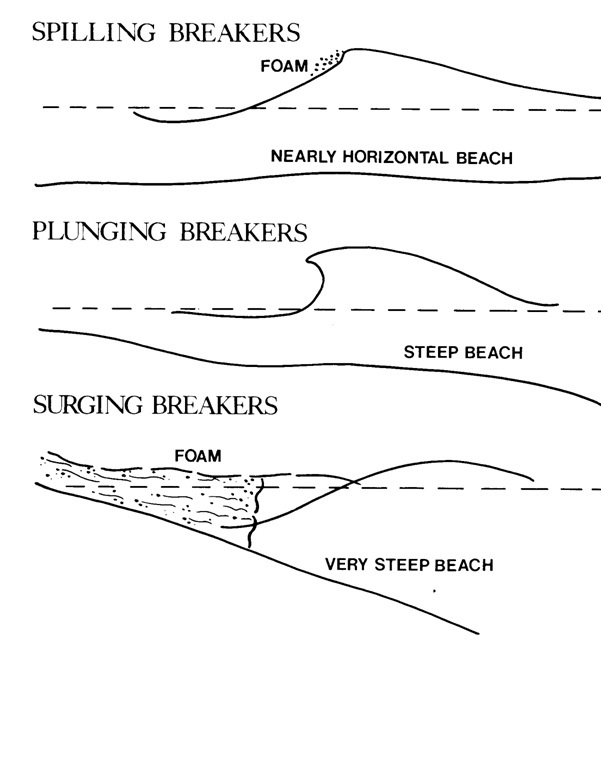 Plunging breakers – usually occurs on shores with tall cliffs, with waves that are of medium height. In this type of breaker, the force of the wave is stopped abruptly as the crest curls and then falls strongly. 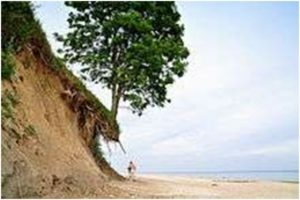 Surging breakers – are also seen on shores with tall cliffs but with waves that are low in height. 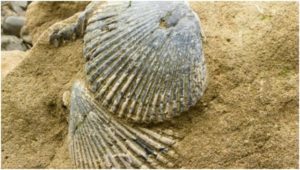 These involve a quick upward motion of the wave’s base to the swash slope and the vanishing of the topmost portion of the wave. 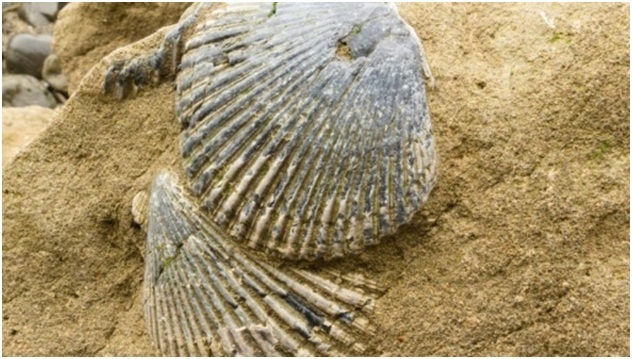 Constructive Waves – low frequency waves usually progressing over a seafloor that is tender. These waves are produced at a great distance from land and thus have a higher rate of friction and move slower. This produces breakers where the water is oval in shape. 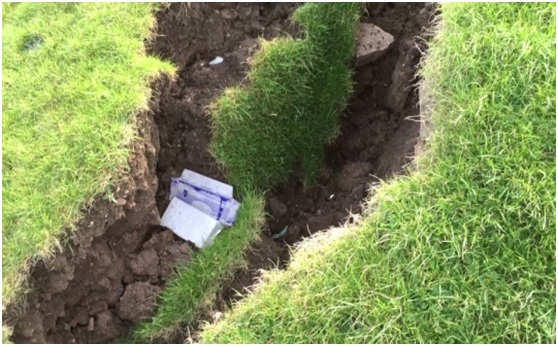 When this breaker falls off, the wash builds up the gentle gradient. Destructive Waves – this is the result of locally produced wind. It has a higher frequency of waves and can be very damaging, especially to houses that are near the shore. Rip Currents – these are forceful and narrow passages of quick-flowing water that surge away from the shore. These currents can increase speed drastically in a short span of time. The strong flow can sweep away a person’s feet in a flash. Undertow Currents – a wave that has already broken pushes the water toward the beach and the gravitational pull reverses it, pulling the water to return from the shore, which is called backwash. 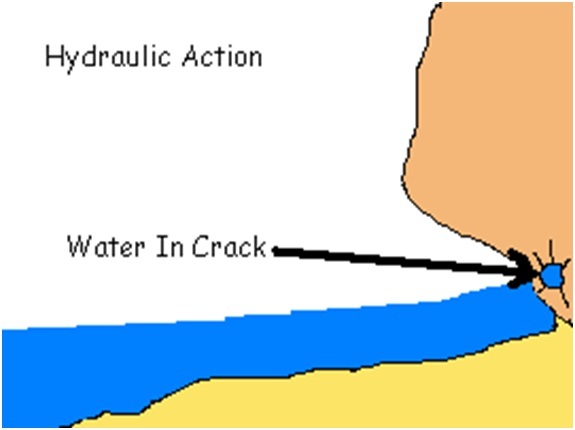 Hydraulic action – passing waves hit against the cliff’s front end, putting gases that are inside the cracks and other openings under severe pressure. Abrasion – incoming waves toss pebbles and other small objects against the coast, which eventually splits the land apart and can actually smooth the surface. 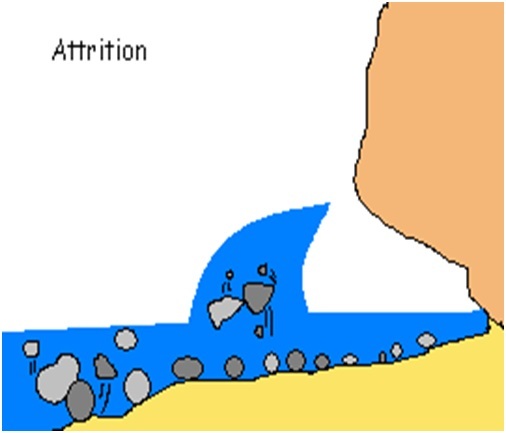 Attrition – occurs when other types of erosion are persistent. As rocks consistently crash on each other’s surfaces, they lessen the mass of the objects on the coast. Salt crystallization – shattering of rocks. Saline solutions leak into openings in the rocks and undergo evaporation which leaves salt crystals behind. 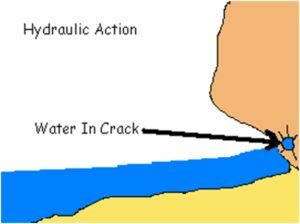 Freeze-thaw – water gradually gains entrance through cracks or openings in rocks which leads to the rocks breaking. 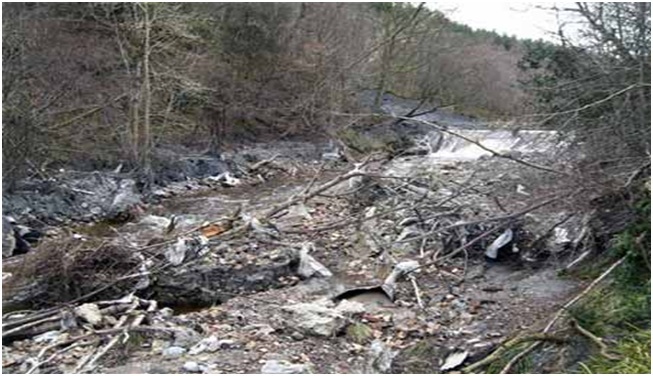 Biological weathering – continuous shattering into parts of rocks because of plant and animals. 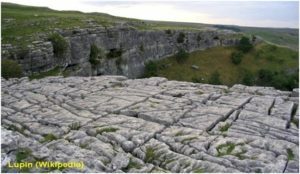 Solution weathering – due to precipitation, small amounts of carbon dioxide from the air produce an acid that has the ability to soften limestone. 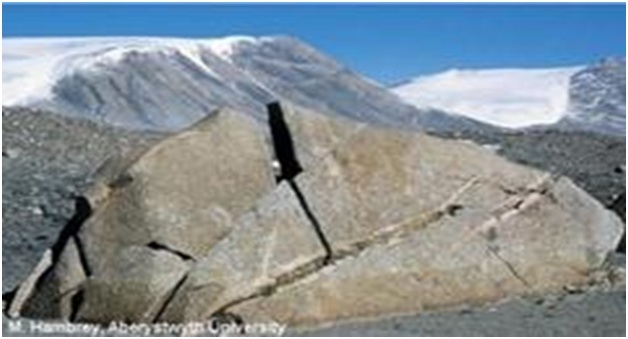 Mass movement – soil and rocks shift downward, usually as a solid mass, because of the gravitational force. Soil creep – the gradual distortion of rock and soil as a result of continuous exposure to pressure and stress. 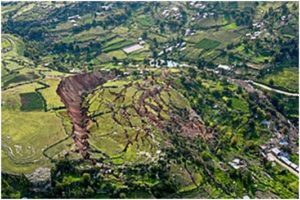 Landslides – the downward movement of rock, earth or debris on a curved part of land. They are usually caused by precipitation, movements of tectonic plates, and volcanic eruptions. 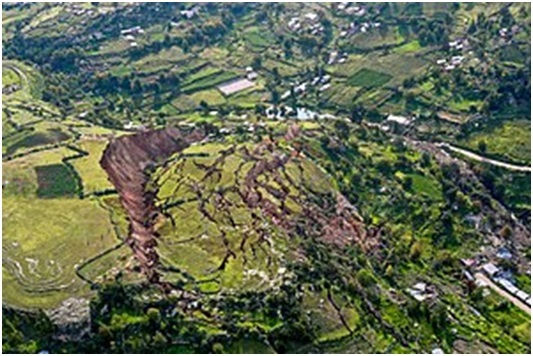 Slumping – a type of mass wasting that happens when an accumulation of a mass of different layers of rock moves downward a little distance from a slope. 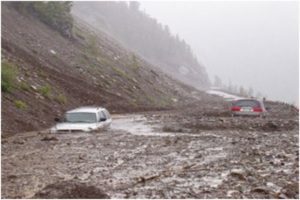 Mudflow – another type of mass wasting with a severely fast flow and a surge of debris that has become partially liquified because of large amounts of water.